Lotteries only take place a few times a week and once you’ve purchased your ticket it’s all over. Secure online casinos offer a variety of casual games which you can play in the meantime for less than a lottery ticket and for quite a lot longer. We’ve chosen some of the best suited for our international readers, please note that this page is for informational purposes only for Australians due to online gambling being banned in Australia as of September 2017 due to the Interactive Gambling Amendment Bill coming into full effect. What are casual games at Internet casinos? Online casinos offer a huge range of pokies, blackjack, roulette, baccarat, poker and other table games. This is the standard expectation of online and offline casinos. However, Internet casinos add something extra with casual games for players who aren’t interested in traditional real money gaming. These types of games are simple to pick up and perfect for all players, beginner or advanced. 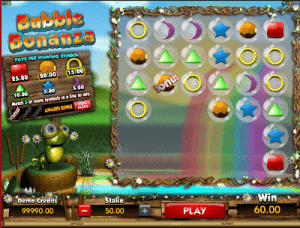 They provide light entertainment, while still offering the chance to win real money. Most software providers offer a small catalogue of casual games, including Microgaming, Playtech, Net Entertainment and more which can be found at our favourite online casinos. If you like the random chance associated with lotteries, the following casual games will suit you perfectly. Keno is considered to be a lottery variant and is a great alternative to Powerball or Saturday Lotto. Playing online means you can decide the pace of the game. You also get better odds, and you can play unique variants like Microgaming’s Monkey Keno. There’s a cute little monkey on the side of the game which throws the balls into their position as they’re drawn. There’s 80 spots to choose from with a maximum of 15 eligible to be picked. With a minimum of $0.10 and a maximum of $10 per game you will find you can play many more rounds than lottery games. 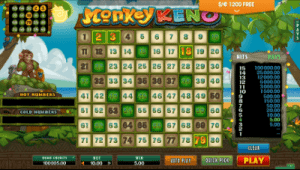 Find Monkey Keno at Royal Vegas Casino. This game is perfect for the lottery lovers as it follows a lottery-style system. Every minute, five numbers between one and 48 are drawn coloured either blue, yellow or red. There’s eight betting options to choose from and you can pick more than one to play at one time, too. Players can wager on the colour and the exact number, the mix of colours which will be drawn, what the 6th ball will be numbered, whether the numbers will descend or ascend in order as they are drawn, four numbers you believe will be drawn, whether the last ball will be lower or higher than the first ball and what the total amount of all six balls will be. There’s also a chance to win a progressive jackpot and to do this pick five balls and if they appear out of the six drawn you win – simple as that. This option is only available in real money mode so be sure to log in and make an easy deposit at Casino.com, where you can find the title. 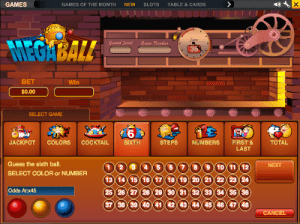 Scratch cards are another great alternative to lotto games as they provide simple gameplay – you simply purchase your ticket for the amount you wish to spend and scratch the virtual card. Play’n Go has created a beautiful scratch card with a golfing theme. It comes with audio effects often heard on the green and as you scratch part of the card you can hear the sound of a real life card being scratched. The minimum of $0.50 and maximum of $2 per card available means you can play a variety of different options in the one sitting. Simply purchase the card by adjusting the bet size and scratch your card to see if you are a winner. This is more of a real money Candy Crush variant, but it still is a great alternative for lottery players. The Microgaming casual game features a 6×6 grid with a backdrop of a stunning secret garden. There’s a base game here plus an additional bonus round for lottery players after a little more excitement. Players need to get as many of the same types of bubbles as possible with 36 released when you press play. The minimum bet here is $0.10, while the maximum available is $50. The bubbles are released and matching bubbles burst and disappear paying out as other ones take their place. This continues until no more winning combinations can be made and the game starts over. There’s also a bonus game where you can activate eight more bubbles on the screen to win more. We always recommend games which can be played online due to their convenience, lower house edge – usually by quite a large percentage – and their unique content from top software providers. The odds of winning the lottery are astronomical, where as the odds of winning on casual games are more realistic and attainable. Casual games are also great for mobile games as they require little concentration – but you can still win real money unlike the games you find in the App store where you may even end up spending with no chance of a return due to in-app purchases.